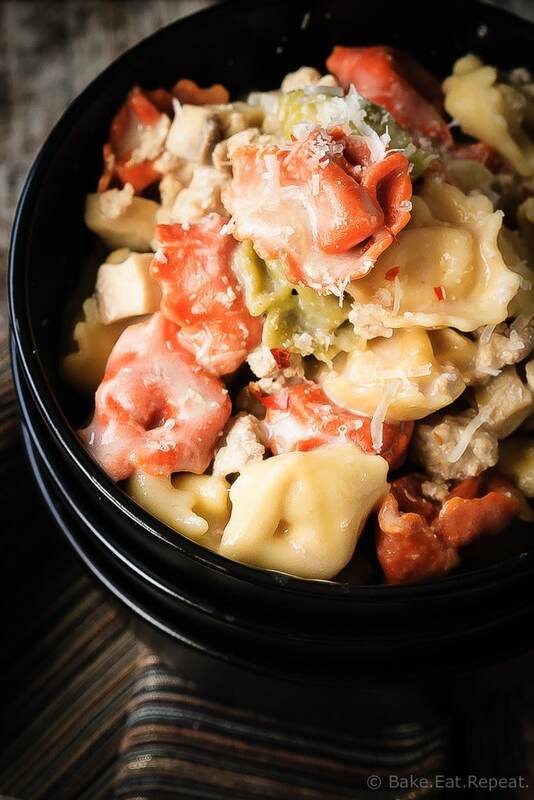 One Pot Turkey Mushroom Tortellini - Bake.Eat.Repeat. Tender cheese tortellini in a creamy white sauce, this one pot turkey mushroom tortellini is a family favourite – plus it’s ready in 30 minutes! It’s comfort food time here today. Pasta in a creamy sauce with mushrooms involved. That’s my definition of comfort food. And this one pot turkey mushroom tortellini is on the table in 30 minutes which makes it even better. Anytime I can make a meal that everyone in the family loves, and only takes 30 minutes to make, it’s a winner. Even the kids wanted to take the leftovers of this for lunch which screams to me that they liked it. Usually they’re much happier with sandwiches at school and my husband and I do the leftovers for lunch thing. Of course, my 5 year old didn’t actually eat most of the tortellini that I sent him for lunch, but I’m not even going to worry about that. At least he wanted to bring it! And he ate it at supper. So it’s a winner. I’ve made this one pot turkey mushroom tortellini quite a few times now. It’s one of those meals that I can easily throw together at the last minute. I usually have ground turkey and tortellini in the freezer and mushrooms in the fridge, so when I don’t know what to make for supper at 4pm, this is a meal I can toss together. Those kinds of meals usually become favourites around here. Something that’s easy to make, I usually have what we need for it, and everyone eats it? Yeah, those get made over and over again. Obviously. 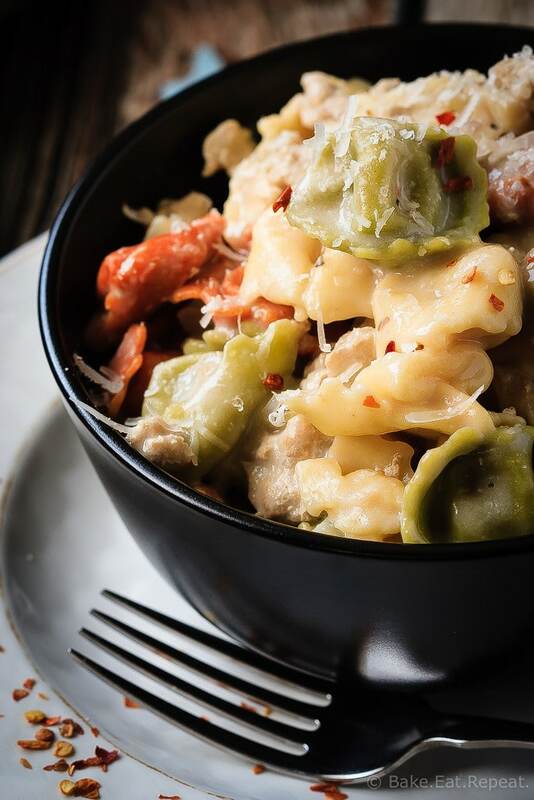 So if you’re looking for a new comfort food family favourite, give this one pot turkey mushroom tortellini a try tonight! 30 minutes to creamy pasta with turkey and mushrooms. That your family will actually eat. Also, it’s the first Thursday of the month, so that means 30 Minute Thursday today! Scroll down to below the recipe to find a list of other 30 minute meals from my blogging friends that will help make your menu planning a bit easier this month. You can also find past 30 Minute Thursday posts here. Tender cheese tortellini in a creamy white sauce, this one pot turkey mushroom tortellini is a family favourite - plus it's ready in 30 minutes! In a large non-stick skillet, over medium heat, cook the turkey, breaking it up and stirring it for 2-3 minutes or until most of it is browned. Add the mushrooms, garlic and celery and continue cooking for another 1-2 minutes until the turkey is completely browned (no pink remaining) and the vegetables have softened. Add the flour, salt, pepper, onion powder, thyme and curry powder and stir to combine. Slowly pour in the chicken broth and milk while stirring constantly. Bring the mixture to a boil and then add the tortellini. Reduce the heat to a simmer (medium low heat) and let it cook, stirring often, for 12-15 minutes, or until the tortellini is tender and the sauce has thickened. Stir in the peas and heat through. You can also add in 1/2 teaspoon red chili flakes to this (same time as the rest of the seasonings) and it's fantastic. My kids don't like it being spicy though so we just sprinkle them on our individual servings. So if you like a little heat, add that in! 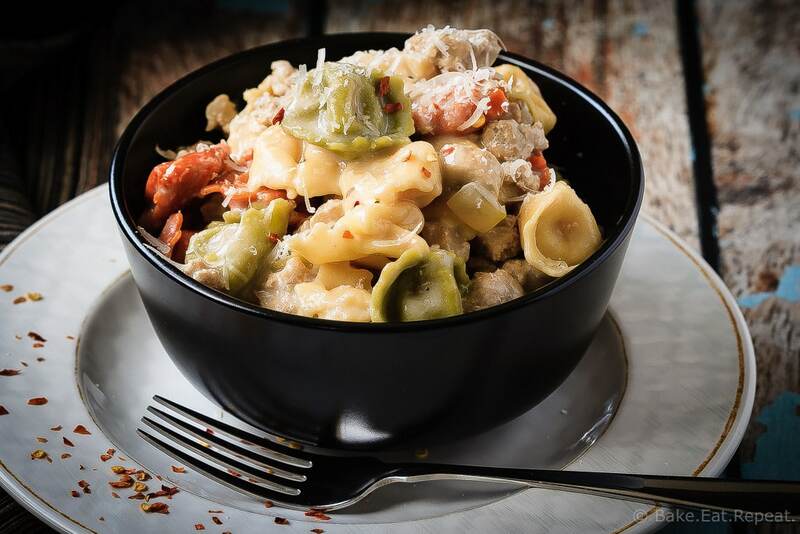 Now I'm totally wanting this tortellini pasta for dinner. Wish I had this instead of my salad. This is a great recipe to have on hand when life just gets in the way. Yum!! You've got me craving a big bowl of comforting pasta, Stacey! Meals like this that become family favorites are the best. I can't wait to try this one! Love meals like this that you can make again and again that everyone enjoys! Pasta is always a favorite around here - this looks awesome and so perfect for busy weeknights! What a wonderful fall meal. Can't resist a 30 minute meal and I love mushrooms! Oh gosh, I haven't had tortellini in SO long and you are totally giving me the HUGEST craving right now, Stacey! Love that it's one-pot and SUPER easy so I can spend less time making it and more time eating it! I'm a big mushroom lover, so I'm very down with this tortellini dish! You can pack this in my lunch box any day of the week! Pasta and mushrooms are my perfect version of comfort food, too! I am a mushroom fanatic...I could eat them EVERYDAY! This tortellini looks delicious, Stacey. Such a perfect dish for 30 minute Thursday!